“This Guy is One Awesome Dad” 20-oz Stoneware Mug | BUDK.com - Knives & Swords At The Lowest Prices! Don’t give Dad a tie or a tired old “World’s Best Dad” mug! Honor him with style and humor with this handsome 20-oz stoneware mug. 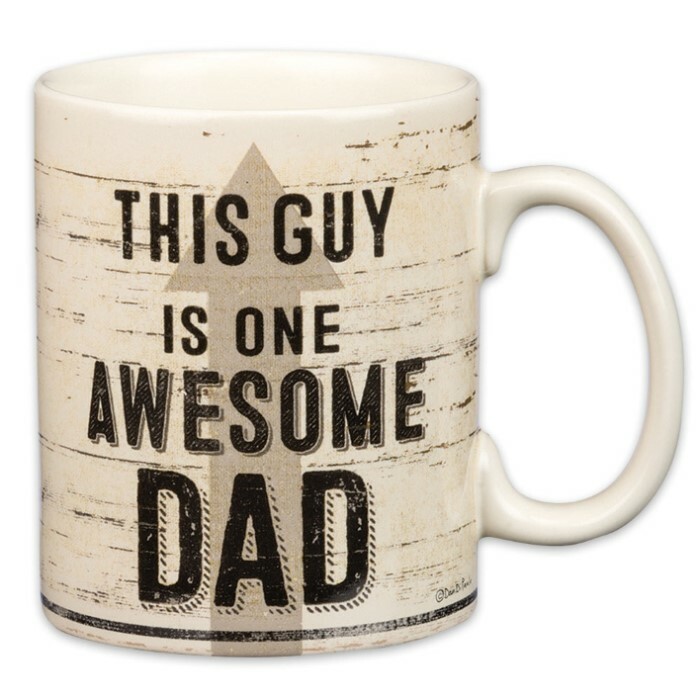 “This Guy Is One Awesome Dad,” it reads in rustic, distressed lettering, above an arrow pointing conspicuously to the mug’s holder (presumably your father). It’s a funny-yet-heartfelt way to let Dad know how you feel for Father’s Day, his birthday or any occasion. Its tough stoneware construction is break- and chip-resistant, so Dad can enjoy his favorite hot or cold drinks from this mug for years, even decades after its gifted.